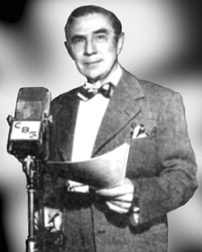 In response to a biographical questionnaire he filled out to assist publicity for his 1935 film Murder by Television, Bela Lugosi said that he didn’t like radio programmes, and at one time it was thought that he had seldom been called upon to perform in the medium. According to one researcher, however, he may have actually made over 200 broadcasts, and it is likely that he made many undocumented appearances on local radio stations as he travelled around the United States, Canada and the United Kingdom in touring stage productions. Of his known radio appearances, precious few appear to have survived. On this page we will attempt to collect together all existing information on his appearances on the radio and all of his known surviving radio broadcasts. Click on the links below for details of each broadcast. Love the blog! Regarding 200 appearances: I have a magazine from a few years back listing more than 200 of Lugosi’s radio appearances. You might want to get that article and reprint it on your website. Hi Peter, I’m glad to hear that you like the blog. The magazine article you mentioned sounds like something I need to read. I’d like to know more about it. Please mail me at andobi@hotmail.com. I too recall the article. It was authored by radio historian Martin Grams if I recall, referenced above in the blog article. There was even reprints of the Kay Kyser radio broadcast with Karloff, Lorre and Lugosi in script form and the 1928 Dracula broadcast with Lugosi. Wish my second wife didn’t make me toss away my magazines. Thanks Joel. I’ll get in touch with Martin Grams. I’d really like to read that article. He was also on Candid Microphone and it is on the internet. Hi Will, that was on this site with a link, but it seems to have got lost when we updated. Thanks for the prompt. I will reinstate it.